We offer complete dental care for infants and young adults. Each Brevard Pediatric Dental Associates office has state-of-the-art equipment to provide effective dental solutions for your child. We also have a fun environment with video games and TVs to make your child feel at home. Conscious Sedations is recommended for apprehensive children, very young children and children with special needs. It is used to calm your child and to reduce the anxiety or discomfort associated with dental treatments. Your child may be quite drowsy, and may even fall asleep, but they will not become unconscious. There are a variety of different medications which can be used for conscious sedations. The doctor will prescribe the medication best suited for your child’s overall health and dental treatment. We will be happy to answer any questions you might have concerning the specific drugs we plan to give your child. Regular dental visits help maintain healthy teeth and gums. We recommend that you start taking your child to see the dentist at 2 years of age. Call any of our offices to schedule a dental appointment. Fluoride helps prevent tooth decay by making the tooth more resistant to acid attacks from plaque bacteria and sugars in the mouth. It also reverses early decay. In children under 6 years of age, fluoride becomes incorporated into the development of permanent teeth, making it difficult for acids to demineralize the teeth. Fluoride also helps speed remineralization as well as disrupts acid production in already erupted teeth of both children and adults. It is certainly important for infants and children between the ages of 6 months and 16 years to be exposed to fluoride. This is the timeframe during which the primary and permanent teeth come in. The American Dental Association recognizes that sealants can play an important role in the prevention of tooth decay. When properly applied and maintained, they can successfully protect the chewing surfaces of your child’s teeth. A total prevention program includes regular visits to the dentist, the use of fluoride, daily brushing and flossing, and limiting the number of times sugar-rich foods are eaten. If these measures are followed and sealants are used on the child’s teeth, the risk of decay can be reduced. Tooth decay is a common problem that affects both the function and shape of your teeth. If left untreated, tooth decay can lead to extensive tooth loss. At Brevard Pediatric Dental Associates, we provide a variety of treatments to help solve the problem of tooth decay. In a safe, relatively painless procedure, a dentist can clean out tooth decay and fill the areas with restorative materials, such as amalgam, dental composites and colored fillings. This prevents tooth decay from returning. Fillings come in tooth color matched and fun colored tooth fillings for primary teeth. If you have a broken tooth or large filling, a crown would be the treatment of choice. The doctor reduces the tooth by removing decay and a stainless steel crown is placed on the tooth like the picture below. Some children are given nitrous oxide/oxygen, or what you may know as laughing gas, to relax them for their dental treatment. Nitrous oxide/oxygen is a blend of two gases – oxygen and nitrous oxide. Nitrous oxide/oxygen is given through a small breathing mask which is placed over the child’s nose, allowing them to relax, but without putting them to sleep. The American Academy of Pediatric Dentistry recognizes this technique as a very safe, effective technique to use for treating children’s dental needs. The gas is mild, easily taken, then with normal breathing, it is quickly eliminated from the body. It is non-addictive. While inhaling nitrous oxide/oxygen, your child remains fully conscious and keeps all natural reflexes. Children may need space maintainers if they lose a tooth early or have a baby (primary) tooth extracted due to dental decay. A space maintainer is an appliance that is custom-made by a dentist or orthodontist in acrylic or metal material. It can be either removable or cemented in a child’s mouth. Its purpose is to keep the space open to allow the permanent tooth to erupt and come into place. Baby teeth are important to the development of the teeth, jaw bones and muscles and help to guide permanent teeth into position when the baby teeth are lost. If a space is not maintained, then teeth can shift into the open space and orthodontic treatment may be required. Not every child who loses a baby tooth early or to dental decay requires a space maintainer; however, a professional consultation should be conducted to determine if using a space maintainer is needed. Temporomandibular joint and muscle disorders, commonly called “TMJ,” are a group of painful conditions that affect the jaw joint and the muscles that control jaw movements. Injury plays a role in some TMJ problems, but for many people, symptoms seem to start without obvious reason. The good news is that for most people, pain in this area is not a signal of a serious problem. Generally, discomfort is occasional and temporary and will go away with little or no treatment. Even if symptoms persist, most patients still do not need aggressive types of treatment. Teeth whitening is a safe, comfortable way to get a bright, white smile. Results and treatment time may vary depending on the level of staining and whiteness desired. Crowns, bridges, fillings, and veneers will not whiten. We recommend visiting our office for a prewhitening consult so that we can help you choose the professional option that best fits your needs. The AAPD (American Academy of Pediatric Dentistry) recommends that you schedule your child’s first oral hygiene appointment when they reach their 1st birthday. The most important reason is a practical prevention program. Dental problems can begin early. A big concern is nursing or baby bottle tooth decay. Your baby risks decay when he or she nurses from a bottle of milk, formula, or juice during naps or at night. Another concern is gum disease. Recent studies show nearly half of all children aged two and three have at least mild inflammation of gum tissues, so, the earlier the dental visit, the better the chance of preventing dental problems. Children with healthy teeth chew food easily, learn to speak clearly, and smile with confidence. 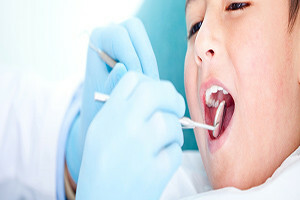 ** The American Academy of Pediatric Dentistry (AAPD) recommends that children have regular dental checkups twice a year. However, some children need additional dental visits due to increased risk of tooth decay caused by growth patterns or poor oral hygiene. Brevard Pediatric Dental Associates will help in establishing a good oral health care plan that will best fit your child’s needs. ** Dr. Milo and Dr. Esser are accepting new patients.